Memelismos is a collaborative, community-specific project by artist Juanli Carrión that uses sculpture to address popular memory and personal meanings embedded in everyday objects. For this iteration, the public in two different locations, Brooklyn and Mallorca, were invited to donate an object that represented a border they had crossed (geographic, political, emotional, social, etc). These two different islands, one a metaphorical island/sanctuary in the US, and Mallorca, one a Spanish island in the middle of the Mediterranean where thousands of immigrants loose their lives in boats trying to cross the border between Africa and Europe. 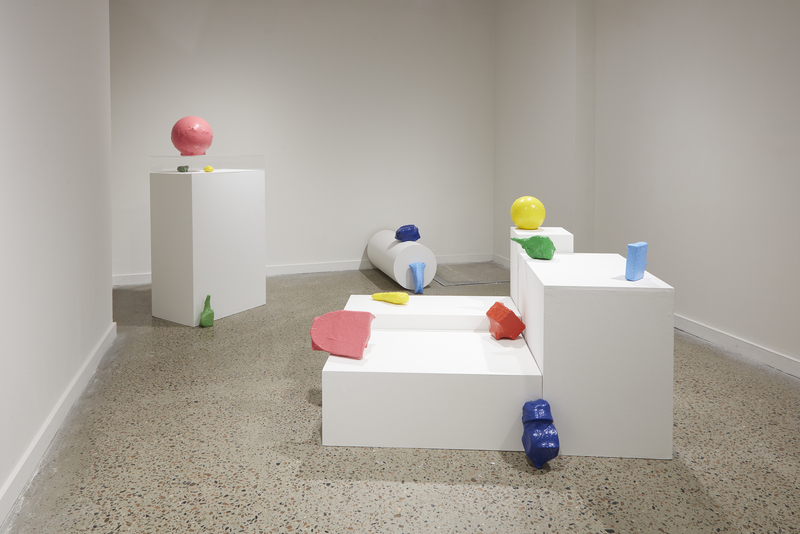 The artist will take these 26 objects collected and wrap them in plastic of different colors, transforming them into abstract sculptures and disconnecting them from specific memories. The contributors of the objects will then arrange the sculptures in the Project Room, re-encountering their memories, physically present but visually abstracted. The installation becomes a collective, community activity that inspires interaction and conversation around memory and what happens when we cross borders. Juanli Carrión is a multi-media artist whose work explores community, memory, and collective and individual identity through site-specific installations. His work has been featured at White Box and Y Gallery, both in NY; Museo de Arte Contemporáneo, Lima, Peru; La Conservera, Murcia, Spain; Rosa Santos Gallery, Valencia, Spain; and Rum46, Arthus, Denmark. His public gardens have been installed in Brooklyn; Manhattan; the Bronx; Holma, Sweden; and Valencia and Murcia, Spain. Carrión is the recipient of numerous grants including from the Brooklyn Arts Council, Partnerships for Parks, and the Ministry of Culture of Spain. He received his BA in New Media Arts from Universite Vicennes-Saint Denis, Paris, and his BFA in Fine Arts from Universidad de Granada, Spain. He is currently a PhD candidate in the Department of Sculpture at the Universitat Politècnica de Valencia, Spain. Juanli Carrión is a 2017-18 recipient of the ArtFP, an open call for Brooklyn-based visual artists to exhibit at BRIC House.